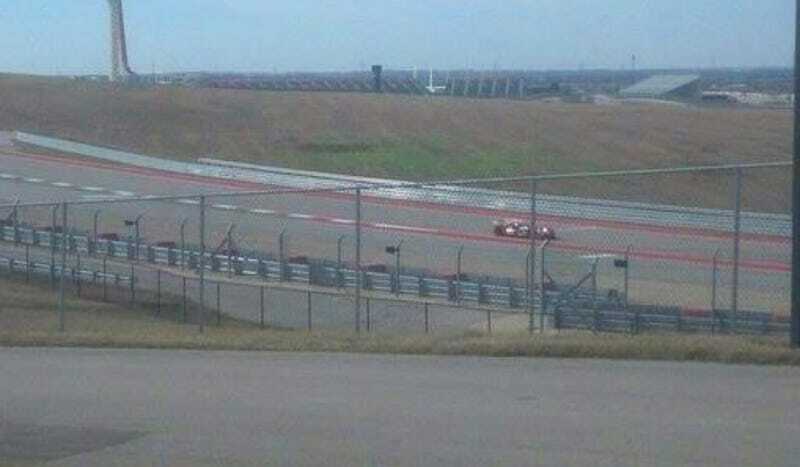 See that long-nosed bloblet on Circuit of the Americas? Members of the Total Arse Racing Team took a few photos of what is reportedly the Nissan GT-R LM Nismo in action this afternoon. This is the car that Nissan will be taking to Le Mans, and it sure looks front-engined to me. Look familiar? Someone chillin' outside Turn 11 happened to be in the right place at the right time and fired off a few snaps. The car also appears to have a rear wing, contrary to speculation otherwise. It could be a higher-downforce setup for twistier tracks like Circuit of the Americas, however, so I'm not willing to write off the wingless theory that Mulsanne's Corner recently described just yet. As always, if you have better shots of the car in action (or perhaps a video of the exhaust note), please drop us a line at tips@jalopnik.com. UPDATE: The source of the photos was originally listed as the PorscheLMP1Fans Twitter account that reposted them. Members of the Total Arse Racing Team group on Facebook were actually the source of the original photos, which are now reposted here with permission.